The Rocky Mountains are located in the Western United States and Canada. 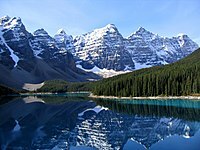 For the ranges of the Rockies entirely within Canada, see Canadian Rockies. Media in category "Rocky Mountains"
This page was last edited on 9 April 2019, at 05:03.